Raised on Yorkshire puddings and Hendersons Relish, Trudi stayed in her home town of Sheffield to study for her degree in Fine Art. After graduating, she worked in London design and advertising agencies and whilst she learnt a great deal in these previous incarnations, the pull to draw was too great. Trudi embarked on a new journey to explore her love of picture books and graduated from Cambridge School of Art with a Masters in Childrens Book Illustration. 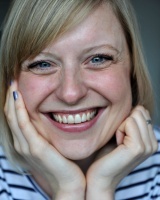 Trudi now works part time as a Lecturer in illustration and writes and illustrates childrens books for the other part. She finds it a much more rewarding way to spend her time and she loves what she does.